This spring’s WalkingTown, DC on April 26 and 27 includes two different tour offerings for the National Mall. See below. 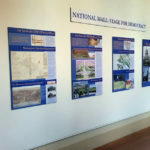 The National Coalition to Save Our Mall will lead “The National Mall: What the Memorials Don’t Tell You.” This is a test of ideas the National Coalition to Save Our Mall has been developing with our intern, Mark Butman, a student at George Washington University. 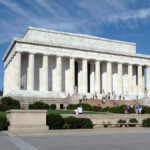 The goal is to create the first of a series of self-guided Mall tours for the new nonprofit National Mall Conservancy –– http://www.nationalmallconservancy.org . Our friends at DC By Foot off four “More than Monuments” tours on Saturday and Sunday. Cultural Tourism DC presents WalkingTown, DC Spring Edition (Saturday, April 26 and Sunday, April 27), a weekend of free neighborhood walking tours (and a few bike tours) across the city. Follow professional guides and community leaders as they share historic anecdotes, point out architectural gems, and discuss current issues. Discover both established and emerging Washington neighborhoods from Capitol Riverfront; H Street, NE; and Anacostia, in addition to better known spots like Georgetown, Capitol Hill, and Embassy Row. All tours are free! Pick one (or several!) at www.WalkingTownDC.org, make reservations if needed, and just show up! Do you think you know everything about the iconic monuments on the National Mall? This tour of the Jefferson, George Mason, FDR, and Lincoln Memorials may surprise you. Inscriptions and sculptures tell a powerful story, but so do partial quotations and historical omissions. This tour is a “beta test” of a future self-guided tour, I Have a Dream: The Struggle for Freedom in America. Comments and critique are welcome. 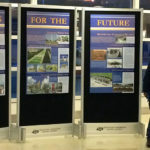 Led by Judy Scott Feldman, Ph.D. and presented by National Coalition to Save Our Mall. The National Mall is filled with legendary stories about George Washington’s love for dogs, why Abraham Lincoln wore a beard, why French women loved Thomas Jefferson, and much more! These young and energetic guides believe that “historical & hysterical is the best way to experience the monuments!” Great for all ages. Presented by DC By Foot Tour Company – Home of the Free Walking Tour.